June is National Home Ownership Month! WASHINGTON - June begins National Homeownership Month, a time of year when the U.S. Department of Housing and Urban Development (HUD) and others mark the importance of owning a home and the impact it has on the lives of American families, local neighborhoods and to the nation’s economic health. 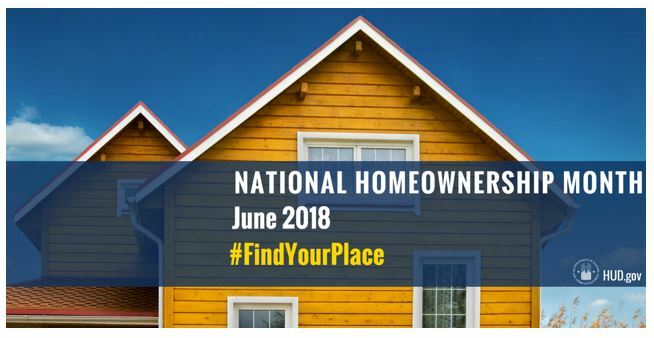 This year’s theme is National Homeownership Month 2018: Find Your Place. “Homeownership serves as an enduring symbol of security and prosperity, and it provides many Americans with a legacy they can pass down to their children and grandchildren,” said HUD Secretary Ben Carson. "During National Homeownership Month, we recognize the abiding value of owning a home, and we rededicate ourselves toward helping hard-working families to find their place in the American dream." For generations of families, the goal of owning one’s home has been essential to achieving the American dream. HUD recognizes the value of owning a home in building household wealth and is working to ensure that credit qualified borrowers can access and sustain their homes. Since 1934, more than 47 million households purchased a home with mortgage loans insured by the Federal Housing Administration (FHA). During the housing crisis of a decade ago, FHA played a critical role in keeping affordable mortgage financing available for millions of qualified borrowers. Today, home sales are at pre-crisis levels and home prices on the rise in most parts of the country as millennials make up the largest segment of first-time homebuyers. Through FHA, and a national network of HUD-approved counseling agencies, HUD is working to make responsible homeownership a reality for millions of Americans. HUD’s Office of Housing Counseling (OHC) supports a nationwide network of more than 1,800 housing counseling agencies. Their mission is to provide individuals and families with the knowledge they need to obtain, sustain, and improve their housing. Read more about the benefits of housing counseling. To help with responsible homeownership, housing counselors provide homeowner education, pre-purchase and foreclosure prevention counseling, assistance with creating a budget and setting financial goals, fair housing information, and a host of other services. Struggling homeowners at risk of default who work with a housing counselor are more likely to get a loan modification, and are 30% less likely to face foreclosure, compared to similar owners who did not get counseled. The median wealth or net worth of a homeowner is nearly $200,000 or 36 times greater that of the median renter who had just over $5,000.